Length at birth a couple centimeters. Maximum body length up to 10 inches. Color: Silver with dark blotches on the flanks, and also have yellow iridescent flecks on the body. Eyes are large and more developed than most fish, binocular vision allows the Archer Fish to forward focus well and judge distances. Lower lip protrudes over the upper. Archer fish may live in both fresh or brackish waters. The flecks on the bodies of Archer fish are thought to be recognition marks between member of species which helps them keep together in the brackish or muddy water. 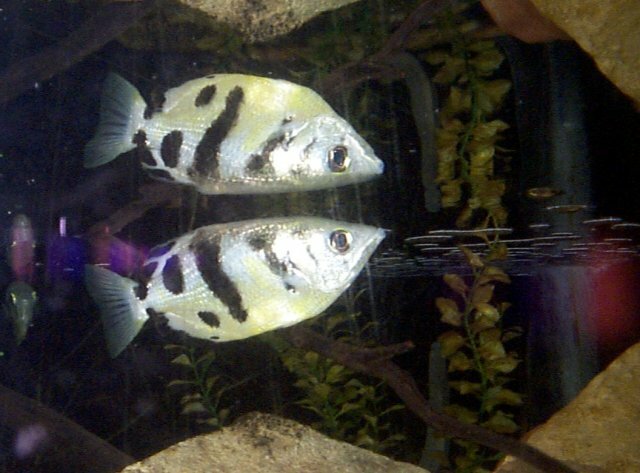 Archer fish are found in coastal regions and estuarine rivers from east Africa to Australia, and in the Fort Worth Zoo! When hunting for prey out of the water, the tip of the snout protrudes from the water surface and the eyes being submerged, water in the gill chamber is forced out by a sudden compression of the gill covers. Archers begin to spit when they are young. If the Archer fish misses with the first jet, it fires many more in rapid succession. The Archer fish spends the majority of its time close to the surface, because most of its prey is located here. However, they have been known to go deeper to hunt small fish. The Archer Fish has several amazing anatomical, physiological, and behavioral aspects.If you were to have an Olympic fish triathlon this fish would definitely win gold. The archer is capable of leaping 12 inches out of the water and catch prey in its mouth. It can also launch a jet of water out of its mouth, to knock down bugs flying or walking on the plants above. The archer picture to the right, the Archer fish uses its binocular vision to look for prey on or above the surface of the water. When the Archer prepares to launch water it uses the tongue and top of the mouth to form a longitudinal grove, similar to that of a rifle barrel. Once this groove is made the Archer can rapidly launch several squirts of water with compression of its gills to knock down prey. Archer have been observed knocking down small insects from up to 6 feet above the water surface. The Archer Fish at the Fort Worth Zoo are a very unique species of fish. The first noted account of an Archer Fish was in 1764 when it was presented before the Royal Society of London. The fish arrived with a letter describing the fishes ability to shoot water at insects. The specimen the Society observed turned out to be a Butterfly fish. 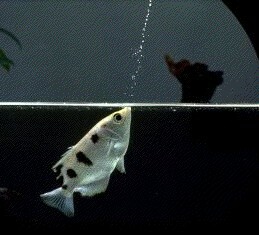 It was not until 1902 that a Russian Scientist obtained a specimen and verified the Archer fish's shooting abilities. As of 11/2/00 the display at the Fort Worth Zoo is under renovation. Devin Hayes, one of the Aquarium Staff members escorted me through the back to get an up close and personal view of the Archer Fish. The Archers currently at the Zoo are about 3 inches in length. They are very shy, and prefer the cover of plants. Devin told me that they feed the Archers crickets and a mixture of vegetables and vitamins. The Archers at the Zoo live in fresh water, but the fish may also live in brackish water. A female Archer is capable of laying 20,000-150,000 eggs but in the wild few survive up to 2 years of age. This new group of fish is very young, so get to the Zoo and watch them. Feeding time for the Archers is between 1-2 p.m. This is a neat time to go see the fish. The Archers that I observed at the Fort Worth Zoo were very shy and prefer cover. This is because they are only a couple of months old. 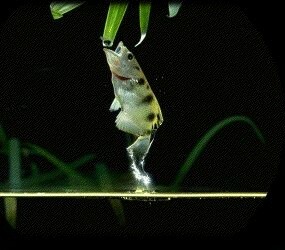 The Archer Fish I observed were amazingly quick! The fish moved so fast my eyes could not focus on them. When I went to observe them, the Archers had not quite mastered the art of spitting. As I looked over into the temporary tank, I felt splashes of water on my face as the young Archer fish practiced launching water at me. I guess that it thought I was a big bug to eat. 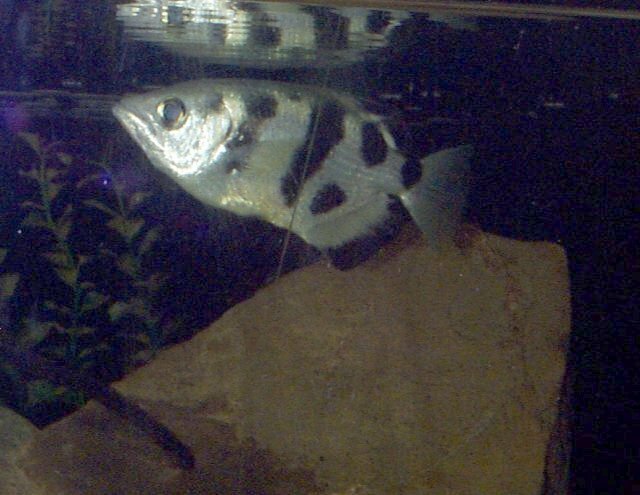 When you go to the Zoo ask a staff member to see the Archer fish up close; it is very interesting to see this fish's behavior.